Cruise, or “Resort” if you are States-based, is the season where, in the northern hemisphere, the winter months are here, it’s dark on an evening, gloomy days and people are thinking of their winter sun. Cruise, as a season, stretches from November through February the following year. With Cruise 2017, Orlebar Brown is celebrating the heady days of summer, with a palette inspired by the American vintage surf. Think Miami, retro ads of the 60s, with the futuristic shapes, colours and design. The colour scheme for cruise season is usually somewhat subdued compared to the mid-summer and Orlebar Brown has mixed up mid-blues, with pastel greens, with a touch of darker green (Juniper) and dark red (Berry). There are some new pieces for Cruise 2017, including Bulldog X, which is a variation of the regular Bulldog shorts, with a much thicker, almost wax-like fabric. The Bulldog X is designed for serious travellers, people who need to use their shorts for long periods of time. Think mountain climbers or jungle explorers. See the video below for the Orlebar Brown Cruise 2017 introduction. Cruise is typically a smaller collection, but we’ve picked out four key pieces. You can’t go wrong with a Bulldog. 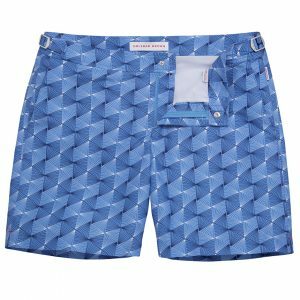 The most popular swim short from the collection, this short has a regular 6″ in-seam, meaning it’s a suitable length for walking around town, as much as it is for swimming at the pool. 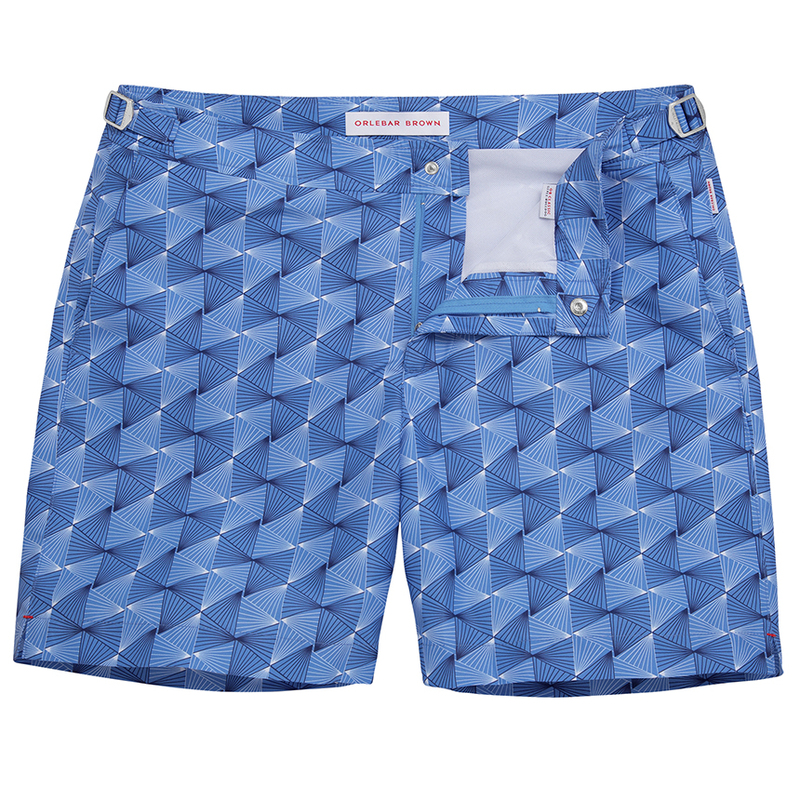 Although we rarely go for any print (we much prefer regular plain colour block shorts), this caught our eye. This catching design is suitable and will never go out of fashion. The Sammy is a classicly cut t-shirt with a slightly heavier weight cotton. 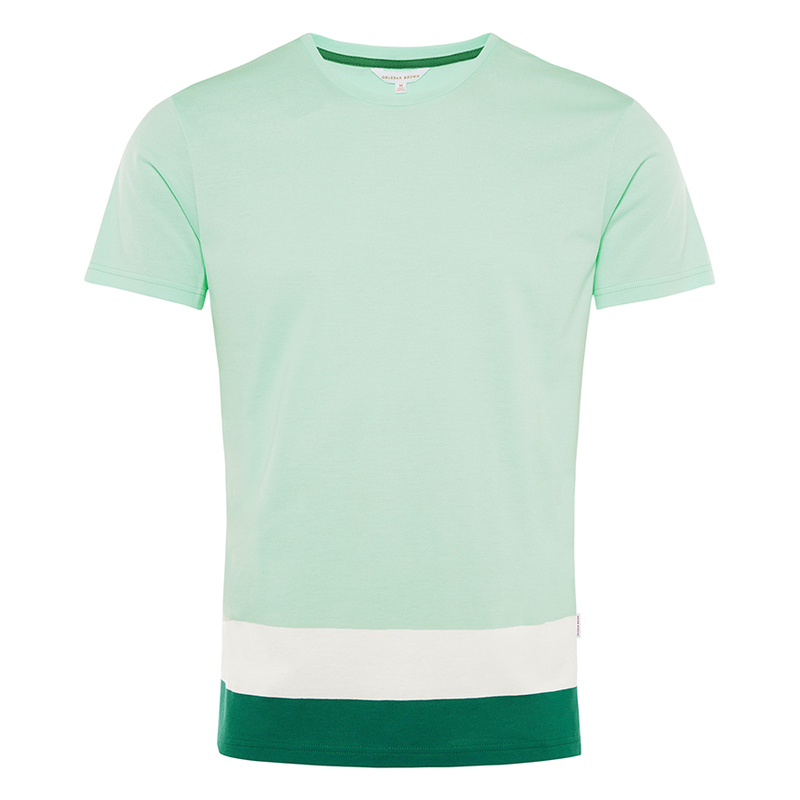 Made from 115 grm cotton, this tee is fashioned from three different colours taken from the Cruise palette. As the Sammy is a classic fit, we’d advise going a size down if you’d like a more athletic fit. The Sammy could be layered, but is ideal with a pair of Setter’s on a cooler summer day. 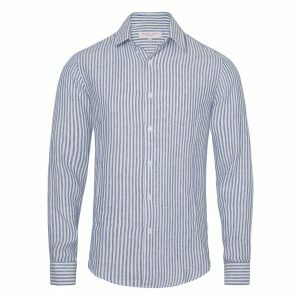 The Morten is a classic shirt, with a tailored finish and will accompany you either in a more formal situation, with a pair of jeans or chinos, or for a casual evening drink, with a pair of white Setter or Bulldog swim shorts. This version of the Morten is a lightweight linen fabric, with front and back darts. We’d advise going a size up if you want a looser fit as this is a tailored shirt. 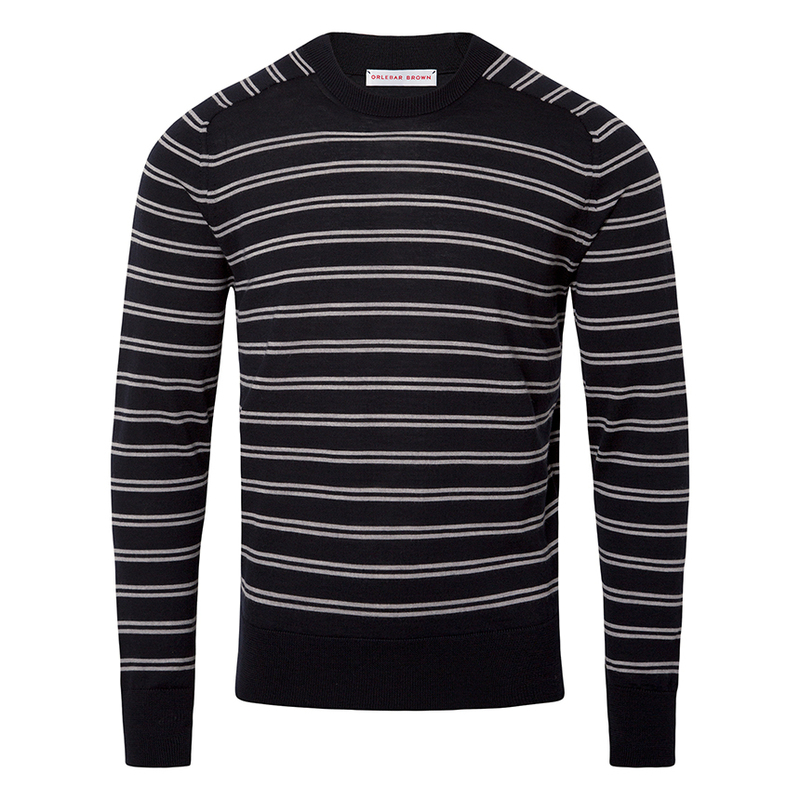 One our favourite Orlebar Brown sweaters. This is a merino wool top, but with a lightweight finish, so perfectly ideal for a cooler summer evening. 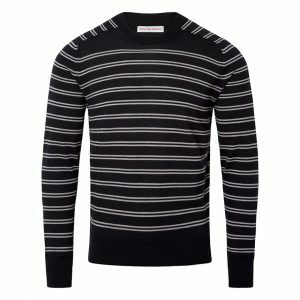 Cut with a tailored finish, this pullover has ribbed cuffs and rather a tight ribbed hem, we would advise going a size up (or two) unless you want an athletic finish. The Lucas is suitable for layering above a lightweight t-shirt such as the OB-T, but we’d advise wearing the Lucas without an extra layer due to the atheltic nature of the pullover. There’s much more to enjoy from the Cruise 2017 collection and these are just a few highlights. 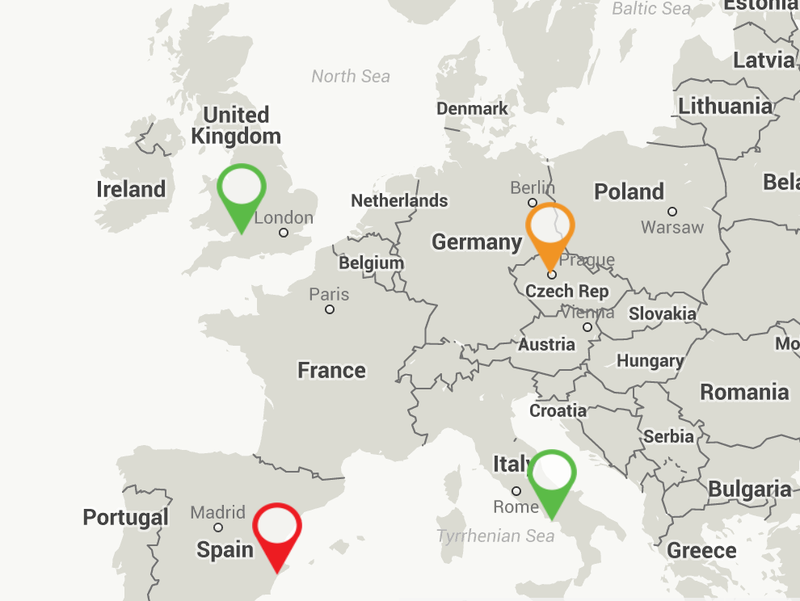 Head over to the Orlebar Brown website to view the complete collection.